And rain that blisters into all consuming smoke. A fresh eruption of bone. 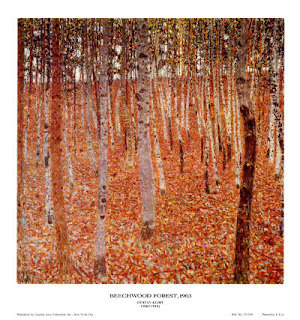 This used to be one of my favourite Klimt landscapes until I visited the Belvedere Gallery in Vienna and saw the original. It was every bit as stunning as I expected, but it was the caption in German that shook me to the core - ‘Buchenwald’, Beech Wood. I can’t ever look at the painting without the German title superimposing itself.